A new HomePod firmware update due to be released in the fall could include some significant new features for Apple's smart speaker. French tech blog iGeneration reports that a beta version of the software currently in internal testing enables HomePod users to make calls and answer them, ask Siri to Find My iPhone, and set multiple timers on the device. 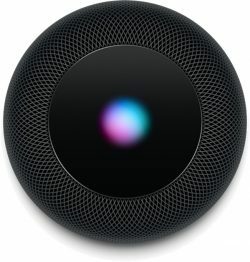 Currently, HomePod owners who want to use the built-in speakerphone feature must make or receive a call on their iPhone and then switch the audio output to the HomePod when the call connects. With the beta software, however, the HomePod appears to have access to the user's contacts, allowing them to initiate the call directly on the speaker. In addition to the above, the report suggests HomePod users could soon be able to listen to voicemails and search their call history over the speaker. Improvements to Siri's general knowledge are also hinted at, including specific enhancements to the virtual assistant's food and nutrition knowledge base. Lastly, the report mentions a new Wi-Fi feature that appears to allow HomePod users to switch the speaker to another wireless network as long as a paired iPhone knows the password. As it stands, users can only choose which network to connect their HomePod to during the initial setup. As with all beta software, these features may be changed, delayed, or removed completely by the time the firmware is officially released. The last software update for HomePod came with iOS 11.4.1, but it was limited to stability and quality improvements. We'll know more about what's in store for HomePod in September or October, when Apple releases iOS 12, along with watchOS 5, tvOS 12, and macOS Mojave. You can’t even make a call with current homepod??? Why do they even call it a smart speaker? You couldn't make voice calls on an Echo until 3 years after it came out, Google Home couldn't for nearly a year after it came out... Echo just got text messages in February, and Google Home still can't send them - a feature HomePod had at launch. Question. Can you use the homepod as a speaker only via wifi/bluetooth and turn of all other 'spy' features like siri/microphones ect?? You can tell Siri to stop listening. I don't see any reason to buy a HomePod though if that's what you're going to do with it, especially if you're prone to paranoia. Great news - calls were the biggest feature I missed after switching from the Echo, and this would make HomePod the only platform that can actually answer incoming calls. Find my iPhone I've been using a homebridge module I created for it but native support is more than welcome. Multiple timers is extremely basic functionality and it probably should have shipped with it. I'm very happy Apple is putting work into the HomePod even though sales are supposedly not stellar. I just bought 5 for my house and replaced all of my Echos and even my sound bar with them. Seems odd they wouldn't cover any of this at WWDC though. Please let me choose another tone or music for the alarm. Also, “hey Siri” turns off alarm (should it?). Also, “available in the fall”... not everyone lives in northern hemisphere; why not just say “3rd quarter” or a calendar month? That's why Apple AU's site says "coming this spring" instead. Multiple timers...finally. But if it's only on the HomePod, that would be strange. Hopefully this means it'll be a 12.1 feature. This is the software which should have come with the launch of the device. Apple really needs to get its act together. I'm glad to see more features being added - having used a HomePod since day one I was disappointed in it's original limitations but knew the potential of new features being added over time such as making/receiving phone calls.